1:1 and BYOD are making a difference for student learning and assessment. Making sure that each student has a device is a powerful solution to promote student engagement and increased achievement. Yet providing all those devices is an awesome prospect. When schools can't afford all the equipment that entails, BYOD is a great solution. Student devices range from smartphones to tablets to laptops. Add school-owned notebooks and legacy computers into the mix and you can cover all the bases. With so many different devices in K-12 classrooms, how can schools manage them all, especially when they mix school-based equipment and student-owned devices? Districts need a mobile device management solution. 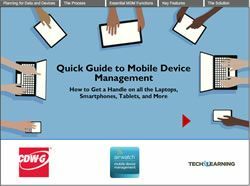 Whether you're just starting to plan your device and management options or are trying to get a handle on the equipment already in place, this Quick Guide to mobility management will help you get it together.